The opioid prescription drug epidemic is not the only challenging drug abuse that the United States is facing. Over the past decade, the prevalence of another substance of abuse has dramatically; increased that is nitrous oxide, also known as ‘Whip-its’. As per the Substance Abuse and Mental Health Administration, there were twelve million users reported in 2012. Whip-its has become a popular trend among teenagers and young adults, as it is easily accessible. ‘Whip-Its!’ canisters containing nitrous oxide are available for purchase at grocery stores, on the internet, and various retailers without any age limit, warning or regulations. Reported cases of ‘Whip-its’ use have been linked to loss of consciousness, anoxic brain injury, cardiac arrest, and death. Yet, another result of chronic nitrous oxide abuse is that of spinal cord myelopathy due to vitamin B 12 deficiency. In this report we present a case of a 22-year-old male with daily abuse of inhaled nitrous oxide in the form of ‘Whip-its’, who presented with initial symptoms of presumed drug induced psychosis and gradually developed neurological focal deficits, and findings of sensorimotor peripheral neuropathy with myelopathy of the cervical spine and vitamin B12 deficiency. Becker DE, Rosenberg M. Nitrous Oxide and the Inhalation Anesthetics. Anesthesia Progress. 2008; 55(4): 124-131. Layzer RB, Fishman RA, Schafer JA. Neuropathy following abuse of nitrous oxide. Neurol 1978; 28: 504-6. Graber JJ, Sherman FT, Kaufmann H, et al. Vitamin B12-responsive severe leukoencephalopathy and autonomic dysfunction in a patient with “normal” serum B12 levels. J Neurol Neurosurg Psychiatry 2010; 81: 1369-71. Ahn SC, Brown AW. Cobalamin deficiency and subacute combined degeneration after nitrous oxide anesthesia: a case report. Arch Phys Med Rehabil 2005; 86: 150-3. Louis-Ferdinand RT. 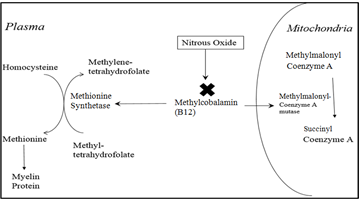 Myeotoxic, neurotoxic and reproductive adverse effects of nitrous oxide. Adverse Drug React Toxicol Rev 1994; 13: 193-206. Chaugny C, Simon J, Collin-Masson H, De Beauchêne M, Cabral D, Fagniez O, Veyssier-Belot C. Vitamin B12 deficiency due to nitrous oxide use: unrecognized cause of combined spinal cord degeneration. Rev Med Interne. 2014 May; 35(5): 328-32. Thompson AG, Leite MI, Lunn MP, Bennett DLH. Whippits, nitrous oxide and the dangers of legal highs. Practical Neurology. 2015; 15(3): 207-209.